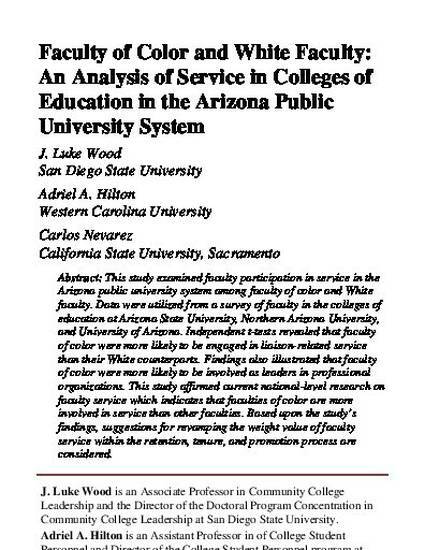 This study examined faculty participation in service in the Arizona public university system among faculty of color and White faculty. Data were utilized from a survey of faculty in the colleges of education at Arizona State University, Northern Arizona University, and University of Arizona. Independent t-tests revealed that faculty of color were more likely to be engaged in liaison-related service than their White counterparts. Findings also illustrated that faculty of color were more likely to be involved as leaders in professional organizations. This study affirmed current national-level research on faculty service which indicates that faculties of color are more involved in service than other faculties. Based upon the study’s findings, suggestions for revamping the weight value of faculty service within the retention, tenure, and promotion process are considered.